Al Wajh (Arabic: الوجه‎), also written Al Wejh, is a coastal city in north-western Saudi Arabia, situated on the coast of the Red Sea. 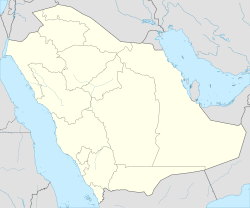 The city is located in the Tabuk Province. It is one of the largest cities in Tabuk region, with a population of 50,000 as of 2013. Al Wajh played a pivotal role during the Arab Revolt in World War I. In 1917, Al Wajh was taken by Prince Faisal's forces and used as a base of operations for a series of attacks on the Hejaz Railway. Al Wajh is a comparatively big city, inhabited mainly by citizens from Al Balawi, Bedaiwi-Alali, Al Huety and Al Johani tribes. Fishing is a primary activity of the city's residents and the port is the central location where this occurs - the Al Wajh port used to be one of the main shipping centres in the region 50 years ago. The town is served by the Al Wajh Domestic Airport and has close links with the city of Tabuk, with a road connecting the two locations. ^ "Weatherbase: Historical Weather for Al Wajh, Saudi Arabia". Weatherbase. 2011. Retrieved on November 24, 2011.